The meaning of crystals within the alphabetical section from U to Z is the theme of this article so this page is dedicated to the final alphabetical section and covers seven alpha groups. There are a number of lovely stones in this section, and quite a few of these have had in-depth pages written about them. Check out the photo grid below to learn what is covered. This page covers all of the stones that I have been able to find and use, that are in this particular section of the alphabetical list of healing stones. 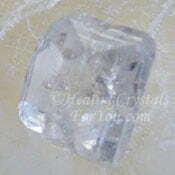 Information about a large number of these stones may be found in more detail on their own pages on this web-site. 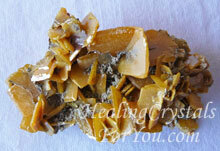 There are many healing crystals for you to learn about in this section. As you are looking through the pictures you might noticed that the name of some stones or crystals are highlighted with a link. This means there is more about them on a dedicated page. This makes it easy to find information on the stone you wish to learn about, by simply clicking on the highlighted name of the crystal. 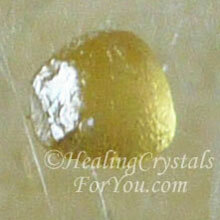 This section of the article provides a short summary for stones that have not yet had in-depth page written, to help you to know if you are interested in this healing crystal. The most relevant and important meaning of crystals that have not yet had an in-depth page written can be found further down the page below the photo grid. Its just a small amount to give you an idea of what to expect from these stones. In addition you may notice in some cases that there are highlighted words within the text about specific subjects, such as developing psychic gifts or enhancing your creativity. 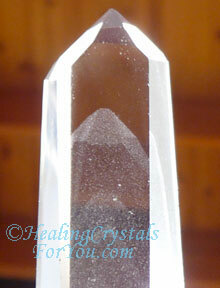 Use these links to move to another article on that aspect of using your crystals. To learn about the meaning of crystals or healing stones that may interest you in another part of the alphabet, discover the meanings of the stones in these categories by checking the site-map page... see link at the bottom of this page. For meaning of crystals or healing stones that may interest you in another part of the alphabet, find out the meanings of the stones in these categories by visiting the site map page... link at the bottom of this page. If you want to discover which of the individual chakras any stone may resonate at, there is a list below the information about the individual crystals in this alpha area, showing which chakras a stone is associated with. It is common for many healing crystals to benefit a number of chakras, so take note that many of the chakra stones will be found in a number of chakra categories within this list. If you don't know what a chakra does, how it will benefit you etc, the name of each chakra is a link, so you can check out why you might choose to use a stone for that chakra. Ussingite is a rare stone that helps to create understanding of the many "bodies" surrounding the physical body, and the effect of these on the life you live within physicality. 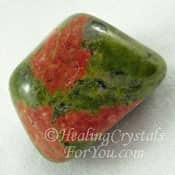 This is a powerful stone to aid anyone who is doing study into spiritual matters, as it helps you to more fully understand Universal truths. It aids forgiveness, and gives you understanding of those esoteric things that you may find difficult to understand. It is great to assist learning in many different fields including in mathematics, science and in the arts. One of its interesting aspects is that it helps you to locate lost or misplaced objects. 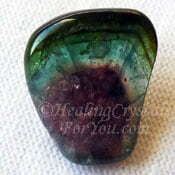 It is an excellent stone to aid you to remember information, a gift we all have if you can just reopen this flow. 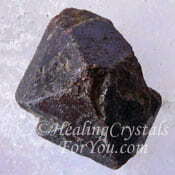 The meaning of crystals like these also relates to their healing action, as they are helpful to assist blood related issues. This includes issues such as over-production of white blood cells, helping hypertension and aiding the production of T-cells. 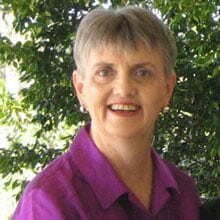 Other healing actions relate to assisting impotency. 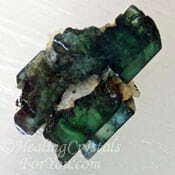 Uvarovite Garnet is a green variety of Garnet, that can form as crystals, or like the one shown here, can form as a layer on a matrix. The meaning of crystals in the Garnet family all relate to their strong energy to aid manifestation, and it is a powerful stone to stimulate the growth of abundance. 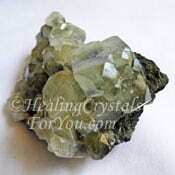 Like most abundance stones, it resonates at the solar plexus chakra, and the action of Uvarovite there is beneficial to stimulate self confidence, as well as encouraging you to embrace all that life has to offer. 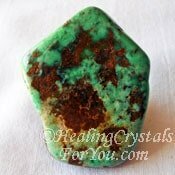 In common with other green stones, it resonates within the heart chakra, and this may assist you to heal emotional problems. By helping you to release any feelings that you do not deserve to have more, you may then be enabled to attract wealth and abundance into your life on all levels. 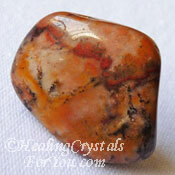 This stone is well known for its strong energy to bring you what you truly need. 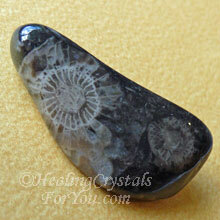 Vatican Stone is Ammonite or Ammolite in matrix stone, that has been tumbled and polished. You can clearly see the fossilized sea creatures in the stones. So why are they called Vatican Stone? Apparently these stones were found in the same quarry that the stones used to build the Vatican came from, around 1500 years ago. 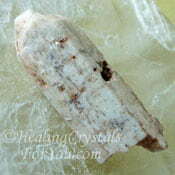 Other than that the meaning of crystals like these has no connection to the church or its teachings. They do have a lovely spiritual energy, and they aid spiritual communication, and their vibration will help you to let go of negative energy. 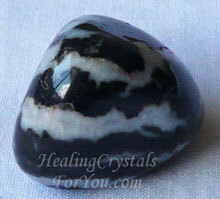 Vatican Stone vibrates within the third eye chakra and the base chakra, and are known to promote patience. 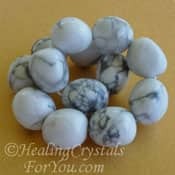 These stones have a protective energy that helps to make life more stable. They help you to have tolerance during difficult life situations. They have good healing attributes that will help you in a number of areas, but will particularly assist degenerative problems. 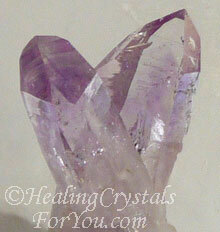 Vera Cruz Amethyst are a quite lovely transparent lavender colored quartz crystal. 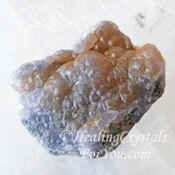 While the meaning of crystals in the Amethyst family may be quite similar, Vera Cruz have a higher vibration. They are particularly useful if you wish to utilize them as a part of violet flame healing brought to renown by Saint Germaine. These lovely violet stones are excellent to assist with spiritual healing, when you need to remove implants or negative attachments. 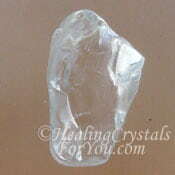 They are also beneficial to use for meditations they will help you to reach a deeper state more quickly. If you are a theta healer, they may help you to get to theta very quickly. They are also helpful to help you if you are in a co-dependant relationship, to break free, and take responsibility for deciding your own future. Viking Balls are stones comprised of algae and fossil remains formed 65 million years ago. They are no longer mined, as the area they come from is a national park now, but are collected from the beach when they are released by storms. The meaning of crystals or stones like these relates to the area they come from in Denmark, as they embody the spirit of the people who lived in these Scandinavian people in the deep past. They are known to provide courage and vitality when you are in dangerous situations, and will also protect you from misfortune or hurt. They embody the energy of the area where they formed. These areas are known to embody the vibration of energy vortexes, and this same energy will resonate into where they are placed and kept. Vogesite is a type of jasper from South Africa. 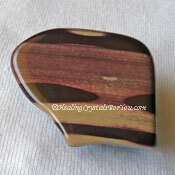 It commonly has swirls and patterns in a range of earthy colors. 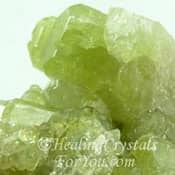 The meaning of crystals like these relates to their energy to aid you to have confidence in your life journey, and to understand where you are and where you have been so that you can go forward with assurance. 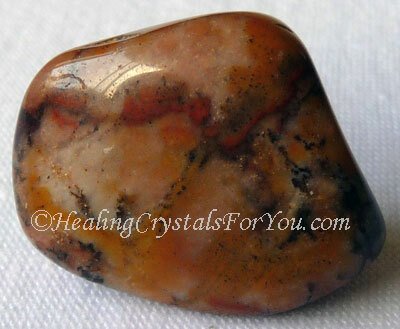 This stone's energy helps you to realize that you already have what you need inside of yourself, and to look within for answers. It is said to be a stone of innocence and it may aid you to reawaken the innocent child within and to heal any pain and negativity that have filled your spirit. Watermelon Tourmaline is deep pinkish red on the interior with a lovely green section on the outside, like a watermelon. While the colors of these stones look like a mixture of Green Tourmaline and Pink Tourmaline, the meaning of stones like Watermelon Tourmaline is a little different to each of the colors on their own. These wonderful stones are heart based stones that promote joy and happiness in your life, and bring a lightening of your feelings and infuse you with joy. 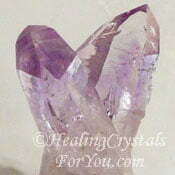 The meaning of crystals like these relates to how they help to awaken the energy of the thymus or higher heart chakra. They may help you to let go of stress, tension and fear and help to promote friendship and loving relationships. Wavellite are generally green colored and are shaped in a lovely wheel or fan shaped form, clearly seen in image shown here. It will assist you to make decisions, because it helps you to see all parts of the situations from all perspectives. The meaning of crystals like these is related to its action to enhance lucid dreaming, and it will boost intuition and psychic dreaming. 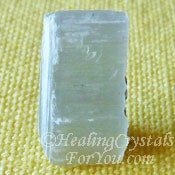 This crystal may be used in past life healing, as it helps to reduce any stress that may occur that is related to any traumatic situation in past lives. It is a lovely healing stone, that it is said to aid detoxification and help to balance the level of white blood cells in relationship to red blood cells. 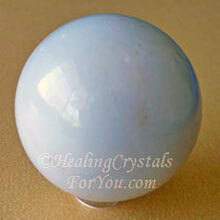 White Cacholong Opal has been used in the past as a love token. It is known to help you to feel better about life, as it helps you to feel that you are safe and protected. It is known to encourage you let go of depression, and may help prevent anger, and may assist you to accomplish more in your day to day life. Spiritually it brings balance to your life, and kindles hope and optimism. Keep under your pillow to help you to remember your dreams. 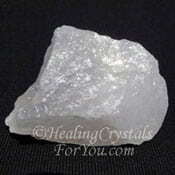 White Calcite is a useful stone to add to your collection as it has a number of excellent metaphysical attributes. The meaning of crystals like these are well known, which is why you will often find it made into spheres, as it has a good action to amplify and increase energy. 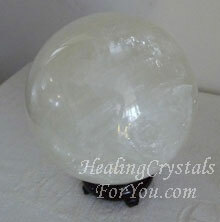 Using a crystal ball made from this crystal may help to amplify the vibration and aid you to find what you are seeking. 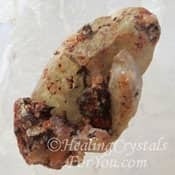 All colors of Calcite are also known to be helpful if you are not sure what you want from life, as they can amplify your desires and bring them to your attention to help you to work out your life path. 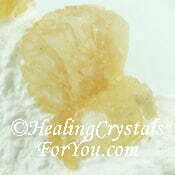 Calcite is one of the most abundant stones on the planet, so White Calcite should be easy to obtain. 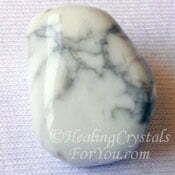 It is excellent to clear negative energy, and it is a useful stone for prosperity, as by combining it with stones that aid you to manifest abundance, it may help to bring the results you want more quickly. 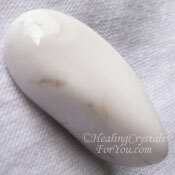 White Onyx resonates strongly within the third eye and crown chakras, and this energy makes it helpful to aid the healing of headaches and eye problems. 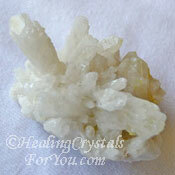 The meaning of crystals like these also relates to its action to boost psychic gifts. It is known to be helpful to strengthen your intuition and it may heighten clairvoyance or psychic visions. 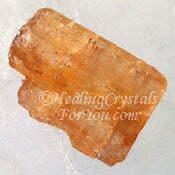 This crystal is known to assist your concentration, and may help you to think more logically. It stimulates an awareness of guidance that is coming from the higher realms, and it is a useful stone to use to improve dreaming. 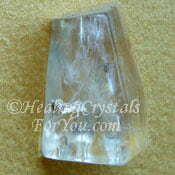 White Phantom Quartz is clear quartz that has a white colored phantom within it. Possibly the phantom is made from an inclusion of white Kaolinite and may sometimes have another mineral in combination with it. The meaning of crystals that have a white phantom relates to its ability to expand the level of light coming through from the higher realms. 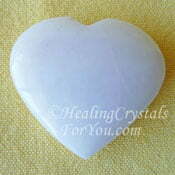 It may assist you with finding your spirit guide, and may stimulate the psychic gift of clairaudience. 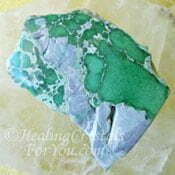 If you use it when you wish to receive distance healing, it is helpful to assist the energy to come through. 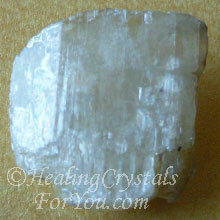 White Scapolite has a strong resonance within the higher chakras. 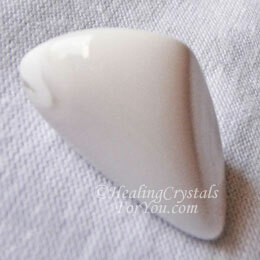 The white variety of this stone helps to open and clear the crown chakra and also stimulates the soul star chakra and higher etheric chakras. The meaning of crystals in the Scapolite family are all similar in some respects, in that they all help you to find your life purpose, and are said to be stones of destiny. 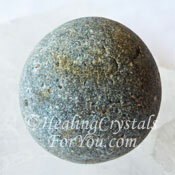 This is a lovely stone that resonates strongly when used during meditation. 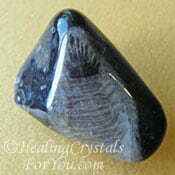 It may assist you to make contact with spirit guides, and to assist you with connecting to angels. Other metaphysical qualities including its action to aid lucid dreaming, and helps you to connect with your higher self. It is a good stone to regulate the chemistry of the brain, and may help anyone who is mentally unstable. Winchite is one of the mineral in the amphibole group and is commonly a yellow or yellowish white color. They are not common and may even be classified as rare stones. 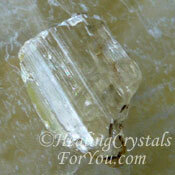 The meaning of crystals in this group often relates to their action within the higher chakras. Their vibration is known to stimulate psychic gifts, particularly intuition, as they resonate within the crown and third eye chakra. They have a calming energy and may be helpful to aid stress. They are said to be a 'stone of tolerance' and may assist you to feel more patience. 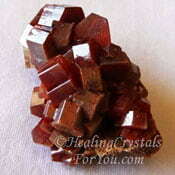 Wulfenite crystals may be a deep orange when from the USA or this caramel color when from Brazil. 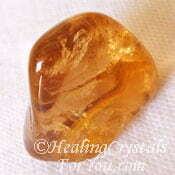 They have a strong resonance within the base, sacral and solar plexus chakras. The meaning of crystals like these mostly relate to their action to boost your creativity, and expand your imagination. 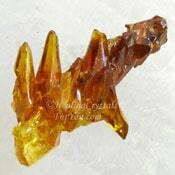 The energy of Wulfenite is very helpful when combined with other crystals as it may enhance the way other crystals work. It is highly advantageous to use them with other crystals known to enhance your creativity, and they may also help to stimulate your imagination. In particular you may choose to use it with orange sacral chakra stones, as it has a very strong resonance in that area. As they are lead based crystals you might prefer to use them by having them sitting nearby, rather than holding them, as lead is toxic. You would never use them to make elixirs, unless you use the indirect method, where the stone does not come in contact with the water. They are quite brittle and so they may be overlooked, as they are delicate to use, as pieces break off them easily, due to their fragility. Xenotime is a good stone to stimulate your creativity, as long as the results are for the good of everyone. It is said to be helpful to aid cancer at the root cause, and helps to release parasites from the body. The meaning of crystals like these are quite interesting, as their vibration will help you to release people from your life who may be taking advantage of you. This may even be those who you may be taking advantage of, as it works both ways. Once you release those people who have been taking advantage of your generosity, you may find your life can move forward in a new direction. It helps you to lose interest in inconsequential and nonessential things, and to concentrate on the things of value that are important to your forward growth. 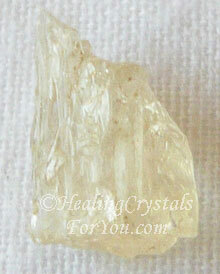 Yellow Fluorite is a helpful stone to use if you are studying, as it aids you to think in a more organized way. While the meaning of crystals of any color of fluorite are similar, all members of the fluorite family will help you to have a more orderly approach to life. The vibration of this yellow stone may also be beneficial to enhance your creativity as well as helping you to let go of toxic emotions. 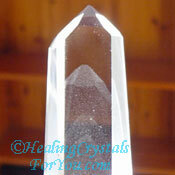 If you need to be able to find something that is lost, hold this crystal while thinking about the object. Then expect to be aware of a couple of possible spots where the item may be located. 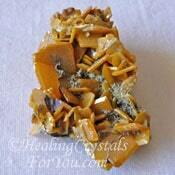 Yellow Richterite is a variety of amphibole crystal, and it resonates strong calming feelings. 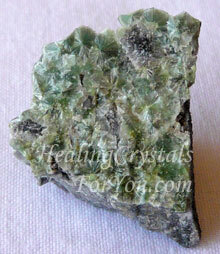 The meaning of crystals like these predominantly relates to its good action to relieve stress. 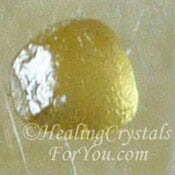 Place a piece of this yellow stone on the solar plexus, when you feel that churning in the gut that often comes with tense and stressful situations. Richterite is an excellent stone to aid the body to heal many health issues related to stress, including helping adrenal fatigue. 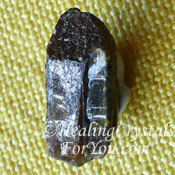 If you have trouble letting go of thoughts during meditation, use this crystal. It will help your mind to calm and aid you to get deeper into the meditative state. 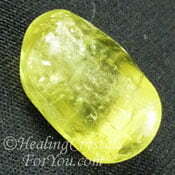 Yellow Sapphire is a wonderful abundance and prosperity crystal, and they are beautiful gemstones. Its energy carries a strong vibration to aid wealth creation and to manifest money. Alternatively you may wish to manifest creative abilities which are also stimulated by its energy. 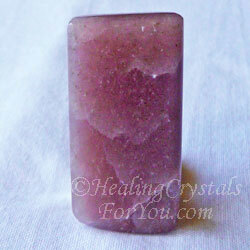 This is a visionary stone that will help you to focus your attention on your intentions. They have traditionally been used in India where they were worn by merchants to ensure the success of their businesses, so the meaning of crystals like these is well known. Their energy is easily felt and will allow you to use the will, the energy of the solar plexus chakra, to focus your intention onto manifesting whatever you desire. 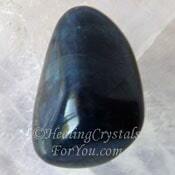 Through the power of your intention, which is strengthened by this stone, it is possible to bring an increase of prosperity and abundance into your life. 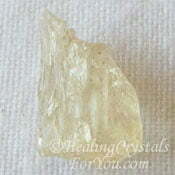 Yellow Scapolite has an energy that is easily felt within the solar plexus chakra, also known as the power chakra. This chakra relates to manifesting abundance, as well as having a strong action to assist you to use your personal power in a better way. 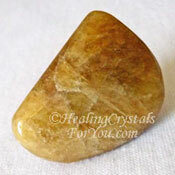 The solar plexus is also where many people experience feelings of fear, and the vibration of Yellow Scapolite is helpful to assist you to let go of any fear you may be feeling. The meaning of the crystals of any Scapolite color, also relates to its action to assist you to build a high level of self discipline and may help you to boost your will-power. 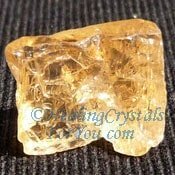 These sunny yellow crystals may help you to foster a more assured approach to life, and its energy may help you to feel happier and more positive about the circumstances of your life. Yellow Tourmaline vibrates at the solar plexus chakra, bringing an energy that will help you to enhance your personal power. A good stone to aid past life recall, and to release old trauma. 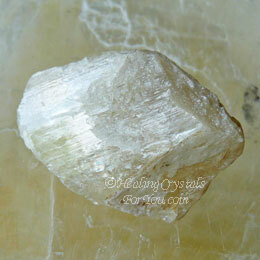 This crystal benefits you by aiding personal growth and self esteem. It aids self confidence and trust in the role of the Divine spirit within your life. 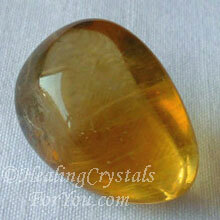 It may aid manifestation and create abundance and prosperity. 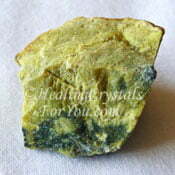 Yellow Turquoise Jasper is the name given to a type of yellow jasper that contains hematite inclusions. It is really not a variety of turquoise at all, so in theory it really shouldn't be called that name. The meaning of crystals like these relates to its action at the solar plexus chakra, which will work to boost your personal power. 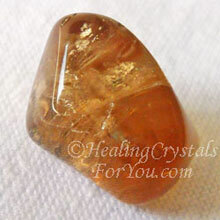 It is a good stone to enhance your creativity and is known to boost your intuition. 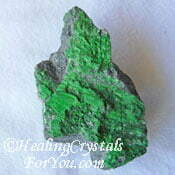 It is said to be highly protective, as well as being a useful healing stone. Zebra Stone is also known as Zebra Rock, and is a mixture of Quartz and Basinite, and this makes for an interesting combination of energy. Basinite has a quite strong grounding energy, and this makes it a good stone to help you to more easily feel connected to the earth. It is helpful to assist you to let go of stress and anxiety, and is known to be helpful to produce heightened energy within the physical body. It helps to create an increase of stamina and the ability to continue going when your body lacks energy. "Those who bring sunshine into the lives of others cannot keep it from themselves." J Barrie. Melody's Encyclopedia, called Love Is In The Earth, is a book that covers more than most. This book gives you so much information, and covers so many crystals that on its own is almost a reference library. Looking for stones in another part of the alphabet? Many of the above stones have their own in-depth page, and there are also pages on specific ways to use your crystals and how they can benefit you, such as helping your creativity or boosting psychic gifts. Want to learn the meaning of crystals or stones that may interest you in another part of the alphabet? To find out more about any stone on this page, learn more by simply visiting the sitemap page, link below.